I have to admit that I've been circling Givenchy Dahlia Divin for several months now - there was something that intrigued me about it (and I love the advertisements), but I just didn't think I would actually like the notes. And I have to say, boy was I WRONG. 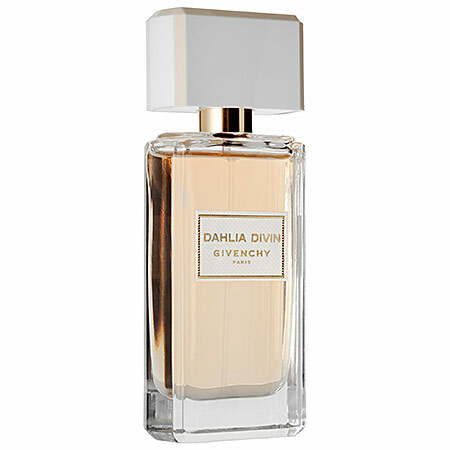 Givenchy Dahlia Divin is now one of my new favorite scents - just as perfect for spring/summer days as the cooler fall. It has a very nice plum fruit note, that combines beautifully with a predominance of Jasmine for it's floral. The overall effect is very lush, feminine and alluring. If you love fragrances that have a bit of "heft" to them, this is perfect for you. On my skin, the sparkling plum dominated for several minutes, and I loved it. It was fruity and sweet, but it sill had a lightness to it that I prefer in fruity scents. The florals came in for me a bit later, and they were very clean and fresh. I would say this is a "sophisticated" scent that any older women would feel comfortable in, but it still has a lightness to it that makes it work for younger women and more casual situations as well. The scent development of Givenchy Dahlia Divin was very nice - with it getting warmer and sweeter on my skin after about an hour or two, and then softening a bit to a more "velvety" spicy-sweetness that was one of my favorite parts of the scent. The silage was very good, allowing it to trail a bit from me, but never too powerful, and I got about 6+ hours of wear before having to touch up. Golden Fruit (Mirabelle Plum), White Flower Bouquet (Jasmine), Sandalwood, Vetiver, Patchouli.